We've had so much lovely new fabric in, and I needed some examples for my Hand Finished Infinity Scarf Class this weekend - well it was inevitable that I couldn't stop at one! Infinity Scarf in Suffolk Garden. I adore these soft plums and damsons on a taupey background - perfect! I'm making a fabric basket example in Suffolk Garden at my class tomorrow too! This lovely springy scarf found an owner as soon as I'd finished sewing it! Cosy! My Littest Person has been taking an interest in sewing lately. It's a new interest. It seems that the magic effect of Miss Stitch has even woven a sewingy-spell on my little scientist and she's started on a hexagon project! 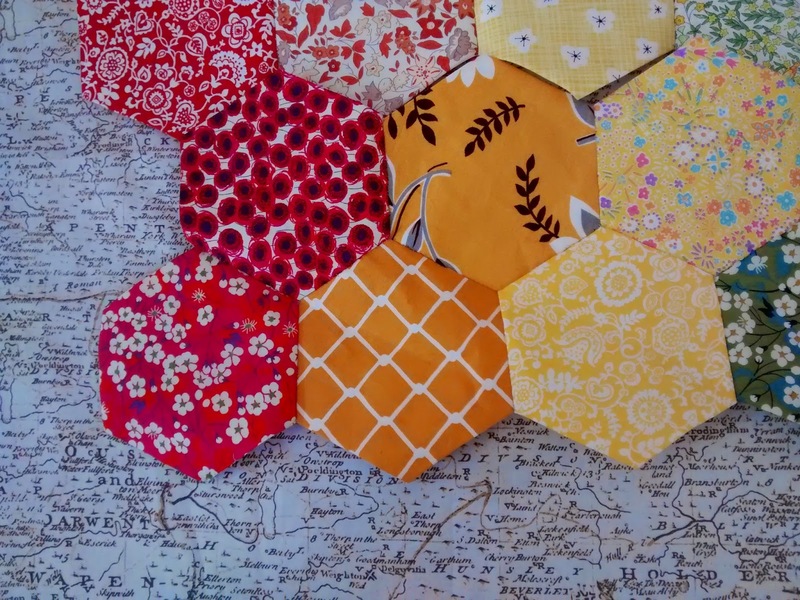 Our pre cut freezer paper hexagons are great for kids projects. 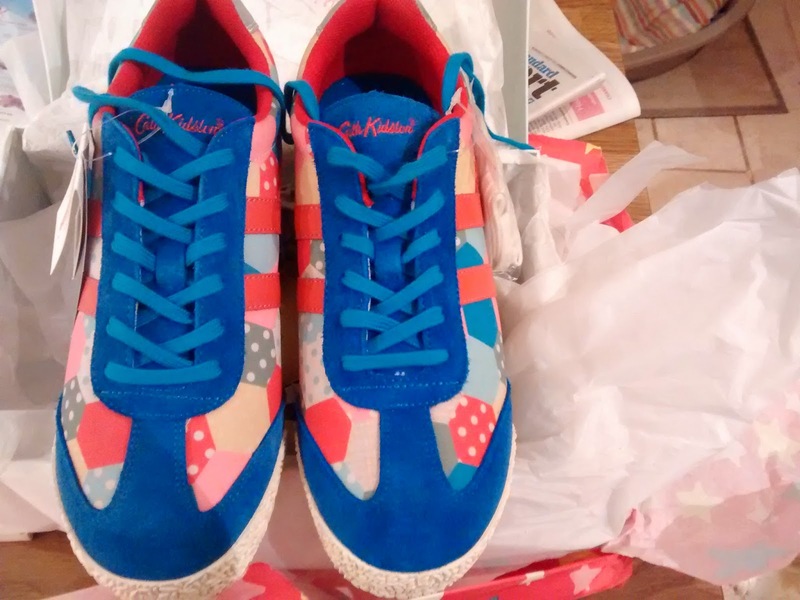 Just iron them on for them and then set them loose with a fabric glue pritt stick and they are away without help! Then today I picked up two quilts from Jenny. This is my Autumn Skies Flying Geese Quilt which I made at the last sewing Retreat Day in October. It's deliciously textured, quilted up with this modern circles design that Jenny worked up especially for me. We tried a more open circle design but it didn't quite work with the geometry of this quilt but I'm using it for another that she's working on now...I'll show you soon. 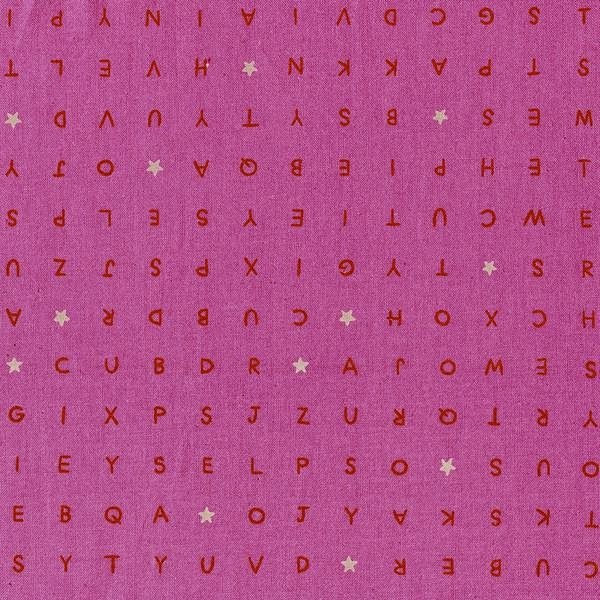 We've tried out quite a few lovely new designs recently so do ask to see them if you've a quilt that needs quilting soon. Jenny will be back for her spring 'residency' at The Workroom soon ( date tbc) so keep an eye out and book a spot. The circles look lovely on the back. I'm so pleased with how this has worked out. Now to choose the binding, so many colour possibilities! Jenny also quilted this quilt top that I made at least 6 years ago and never quite finished. It's an EPP made up of Liberty scraps left over from my Single Wedding Ring monster quilt. This quilt is the softest buttery-ist ( is that a word?) quilt you can imagine. Liberty front and back and I used our New In lightweight vintage style wadding. The quilting design is an all over floral design that I have used before on my Bee in My Bonnet Quilt. My Biggest Girl has been promised this quilt so she chose the pattern. It looks lovely, v girly but grown up. In my quest to have no WIP (work in progress) projects hanging about I have dropped off another two quilts with Jenny. I'll share those in a few weeks too. It's a good job that I do like binding as I think I'm going to be kept busy! Did you get any Monday Making done? Wow, it's been the kind of week where you can't catch your breath. Everyday has either been an exciting kicking off of a new 2015 class or catching up with classes ongoing from 2014 and so many amazing things being made at PlainStitch at the moment. It really is a hive of creativity. I'm so proud of all of my students. The shelves are bursting with colour and we're getting new fabric deliveries almost every week for the foreseeable future it seems like! 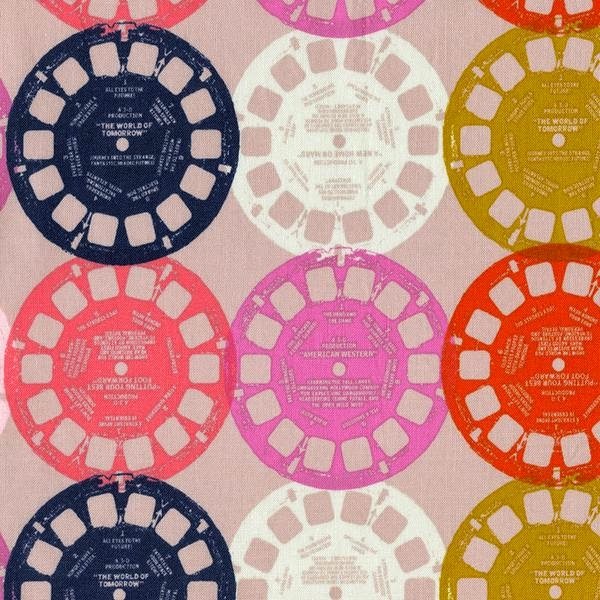 Just as well, as this fabric is rushing out of the door in little brown bags of anticipation, fulfilling so many burning creative ideas! It's all so exciting. New year - new projects! Our latest new fabric line Suffolk Garden has been well and truly pruned on Saturday, I wouldn't hang about if you fancy a bit! We are also expecting our new Cotton+Steel delivery soon. I rewrote our 'classes with spaces' board on Tuesday and already its out of date as another 4 of the classes listed are now already full. We've tried really hard to increase the availability of our classes to meet demand this spring, adding new extra evening classes and more repeats, but we are already choc a block so if you are keen to take a specific class please don't hesitate, we hate disappointing people when classes are already full. Our Farmers Wife class met again on Tuesday and there has been so much progress, amazing colourful blocks coming together here from Deirdre and Charlotte. Sorry everyone else I put my camera down somewhere then forgot where! A proper photo report next time! 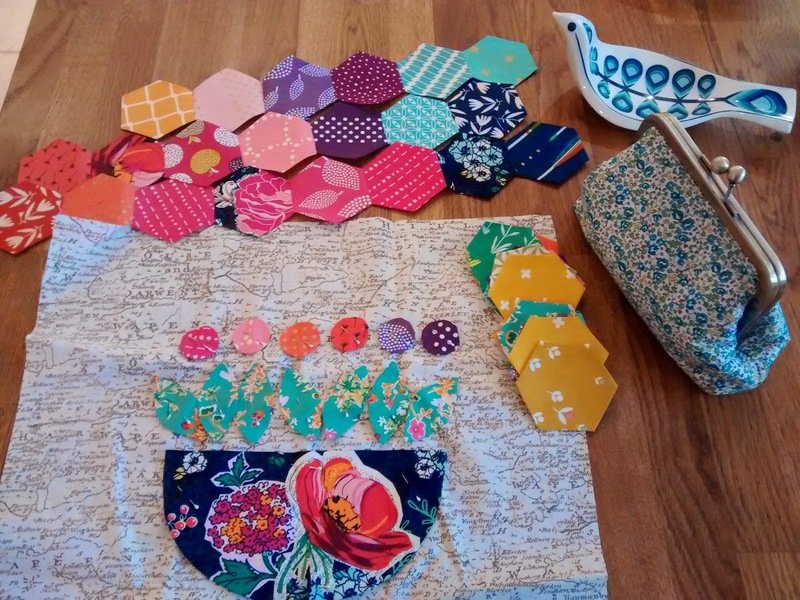 On Wednesday our English Paper Piecing class was back from a winter break with fabulous work in progress, including Mary's super neat EPP tupperware prep box - if that's not a box of sewing possibilities waiting to bust out I don't know what is! I was also loving Mary's Baby Fabric Basket - perfect for sewing supplies! Trudy is amazing! Her Dutch quilt is a mash up of EPP, Appliqué, fabric printing and so much more. This will be an opus magnum when it's finished! Fabulous! Caroline showed off a double-finish! 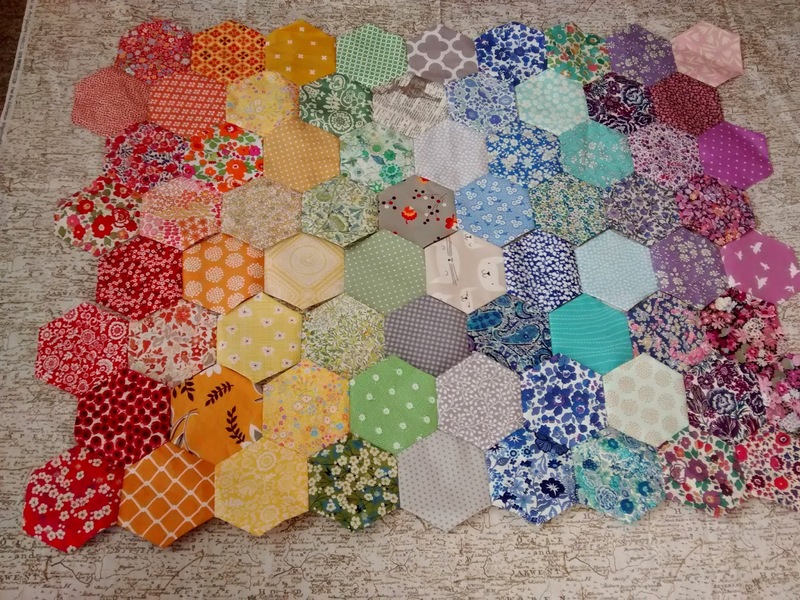 Re-purposed Laura Ashley EPP hexagons from the 1980's from her mum, mixed in with some modern cool greys and lilac purples to make a modern super sentimental lap quilt and cushion that she gifted back to her mum as a surprise this Christmas........just what patchwork is all about. Love and memory in every stitch. Well done Caroline it's gorgeous! We also taught two full classes of really lovely enthusiastic new-to-sewing -peeps in our popular Get To Know Your Sewing Machine Class this week too - talking about the importance of a little bit of tlc for your machine. We're encouraging you all to show your sewing machine some January love this month. A little spritz of oil, a tickle with a nice new brush to get your machine lint free and you'll really notice the difference and your machine will love you just that little bit more back! Oh and Bobbin match mates? Attach your bobbin to the top of the matching thread spool. Believe me you'll never look back after you try these. It's how Jeanne organises her bobbins....eah? You know it makes sense! Look at Netty's amazing EPP from our summer EPP class that came in for wadding fitting today. This quilt is a work of art. I love it. All hand sewn, it's divine! 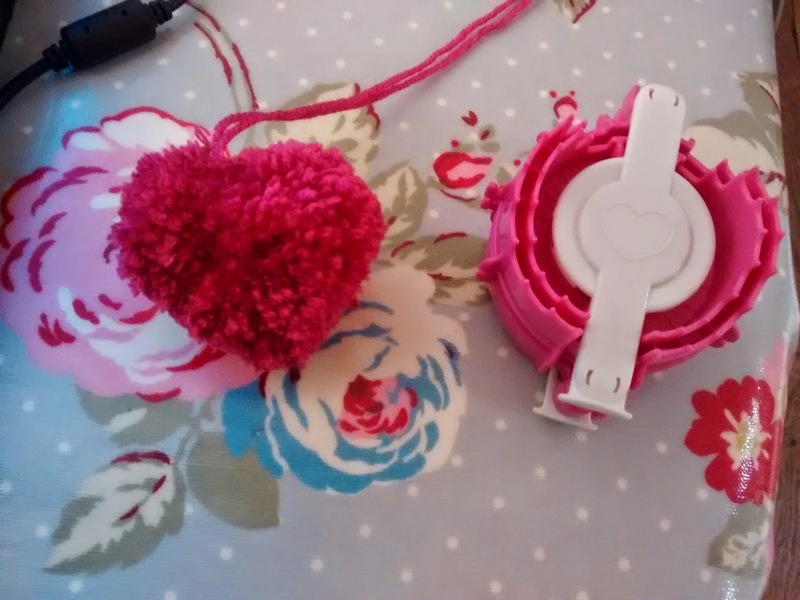 Julia's 'It's Never Dull in Hull' Liberty EPP is also taking shape. Wow. It's stunning! 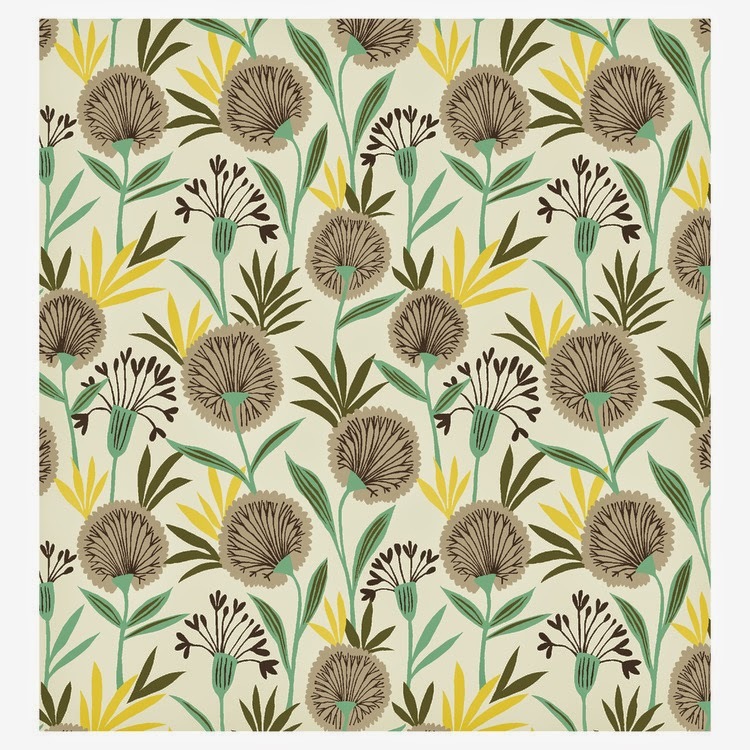 Love that map print as a neutral against all of the Liberty prints and colour. Quilty wanties! I need new EPP! Saturday was a fabulous blazingly sunny blur of a day at The Workroom. The door bell just didn't stop all day. Sue valiantly kept all the balls spinning cheerfully and we just laughed and 'wowed' and chatted for 5 hours solid in the winter sunshine without a breath it seemed. It really is the best job in the world, so many lovely people popping by and sharing their making with us. Some days I wonder if it's possible to squeeze even more making delights into our Workroom, then days like Saturday come along and blow the doors off. Alongside the crush that was The ShopRoom - in the ClassRoom we had a full class making Infinity Scarves - look at their work. Most of the class were new to sewing machine sewing, but they whizzed away happily. We learnt rotary cutting, dealt with seam finishing, and top notch hand finishing. These scarves were couture finished - and don't they look it? Well done ladies and keep toasty this week! 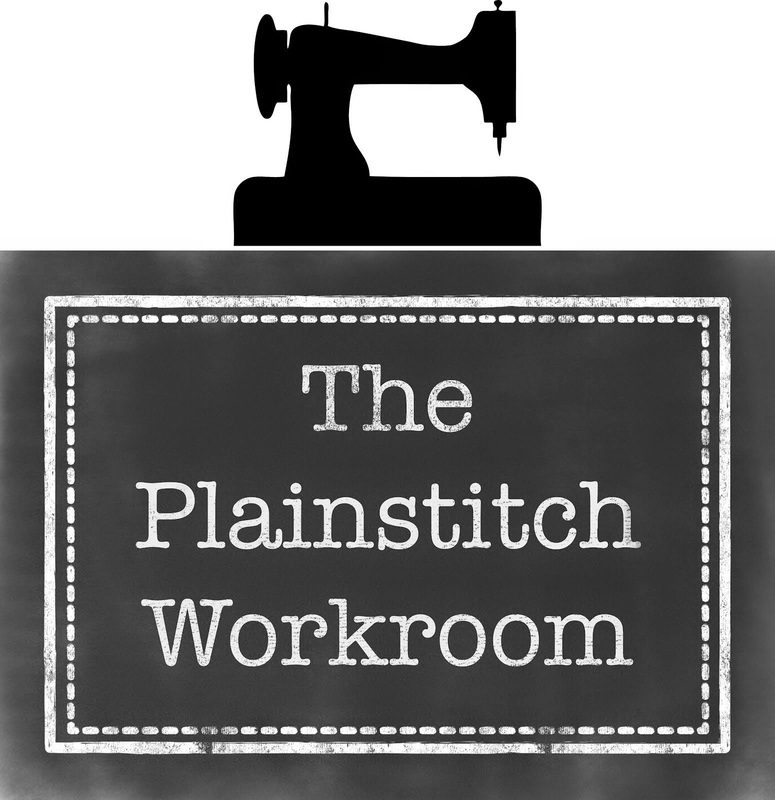 Pop in next week and see what unfolds in another 'Week at PlainStitch'! It's been a grey cold week hasn't it? Typical end of January. We're flighting back at The Workroom with reasons to be cheerful in January! I do love a HAPPY THOUGHT. 1. Yay - New fabric! 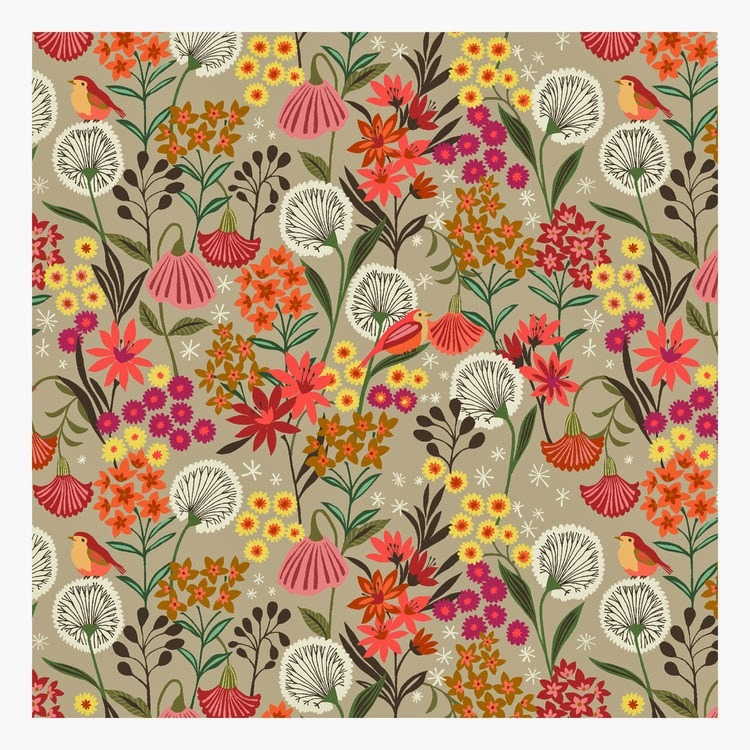 This range is called Suffolk Garden by Brie Harrison. 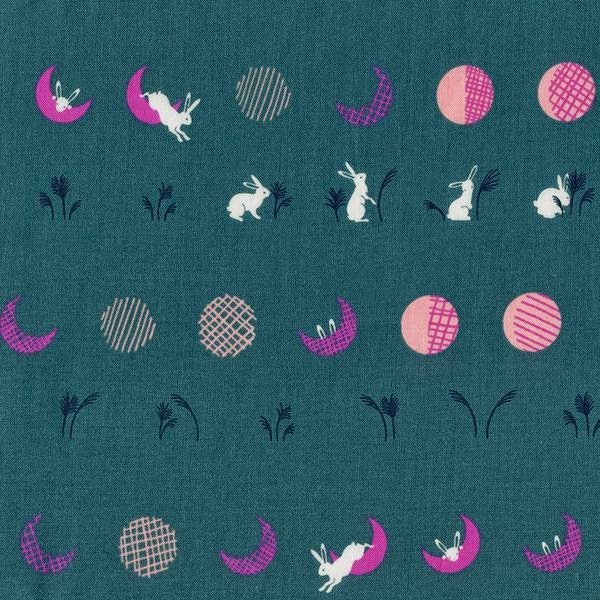 It's one of our most anticipated 2015 fabric ranges. I just adore this soft mixture of taupe and coral, hot pink and grapey purple! It's a colour scheme lots of you are using too, we've picked out so many inspiring fabric combinations this week for so many new classes all gearing up at the moment. It's the best part of our job. Yes, it's fabric.....but do you know what? It's so much more than that. Its a new project. A new start. A challenge. A sewing solace when life is hard or sad. A little bit of sewing peace and quiet in a busy life. A reason to feel cheerful when it's grey and cold. A reason to be home in the warm, sewing. 2. Ta Dah! 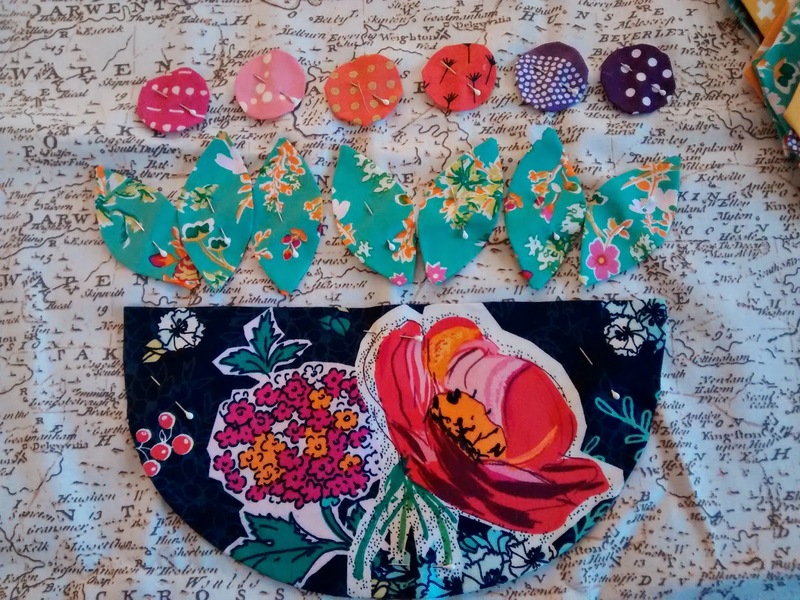 PlainStitch Home Improvements! We painted up a new peg board. You know we LOVE pegboard. 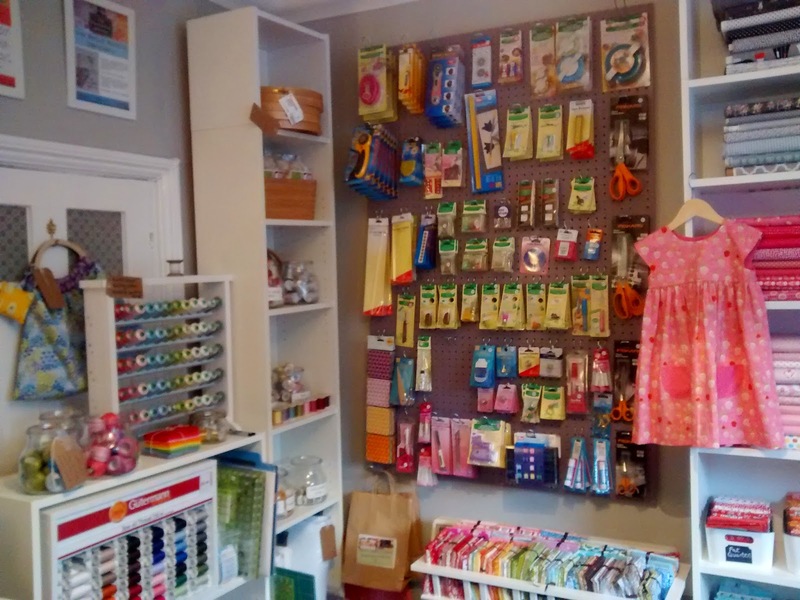 It's been an integral part of PlainStitch since the start and our range of notions had well outgrown the original space! We decided to bust out a new favourite colour - we've been loving all the grapey fabric in the Workroom recently so this purple was an obvious choice ( my bathtub is the same colour) We're getting a LOT of OCD style satisfaction from arranging and rearranging our new supplies too. When life gives you freezing cold grey days, arrange notions! Yes, those are multicoloured Wonderclips....think how happy they'll make you feel every time you use them! 5. Anticipating Retreat Day. The most commonly heard phrase this week at The Workroom was ...'so i've started planning my project for Retreat Day'. Plus I'm getting even more anticipatory fun as I have the menu lists to choose this week! yummy yum x The thought of Retreat Day is such a tonic! 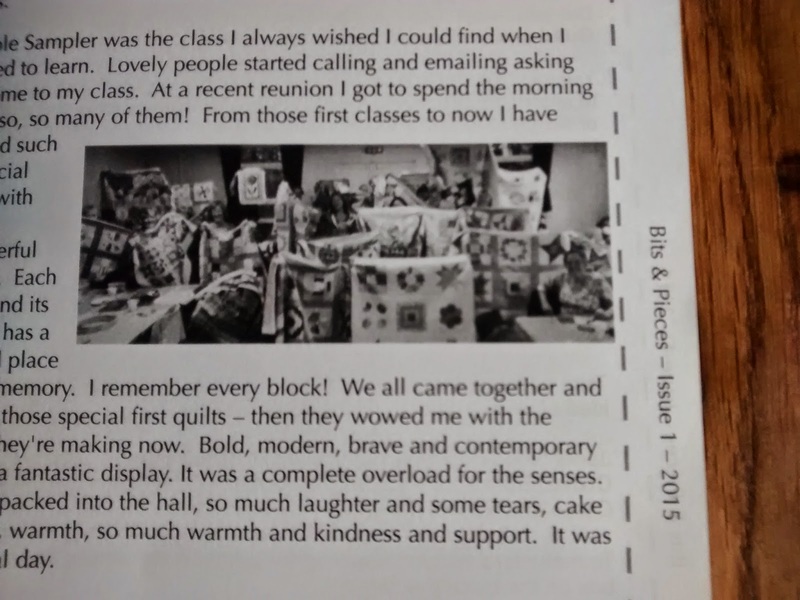 I really enjoyed seeing our recent Simple Sampler Reunion reviewed in The Quilers Guild Spring Newsletter - look at all those lovely quilts! 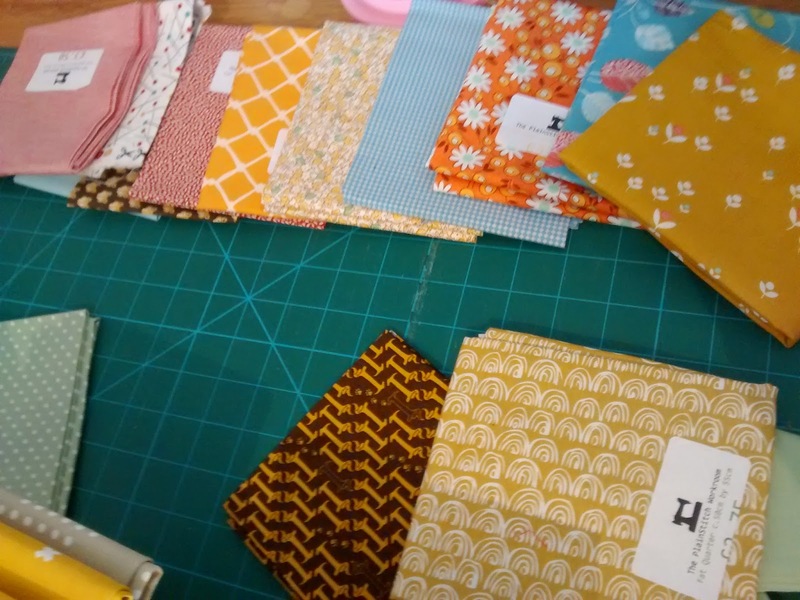 Today we kicked off Simple Sampler again, it's such a favourite of mine, especially this first class - such exciting little piles of fabric ready to make special quilts for their makers. Simple Sampler is such a precious first quilt to make - all those hopes, some trepidation, then such pride when these bundles of fabrics become full blown quilts in a month or so - it's a magical metamorphosis - the only additional ingredient is the hard work of their makers - wonderful isn't it?! Here are some work-in-progress-piles-of-fabric being put together today. I'm really looking forward to seeing them blossom. 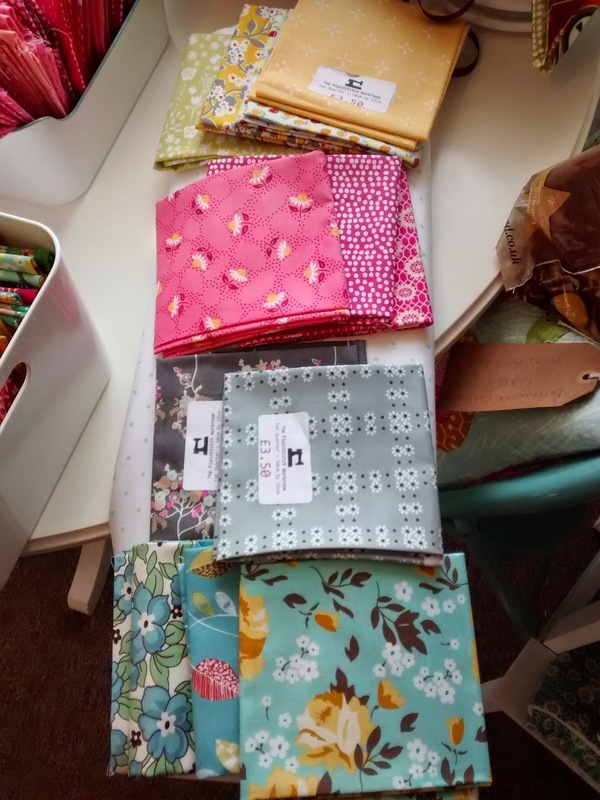 I've been spring cleaning my Work In Progress piles.Pulling out some quilt tops that haven't made it to the finish line yet and pushing on with them. This quilt top has been languishing for a while. It's kind of Not-So-Simple-Sampler! Itried out a whole range of blocks that I had always wanted to make in a Sampler format. This quilt never made it to borders, batting and backing so borders now done I need to get backing and basting and get this one done. As is always the way, I fall back in love with some projects after a little hiatus. Part of my motivation ( as if I need any!) has been enjoying sewing with my new machine. I have been a Bernina girl for a while now, sewing on a little Bernina 330 for a year or so, but I had been hankering after a Bernina 550 for a while. The 550 is a big, whistles and bells machine, ( read expensive, yikes!) that replaced the 440. However the reviews for the now discontinued 440 have always been amazing! I have searched for a second hand trade in one in vain for a few months and this year on Christmas eve idly looking at the website of Home Counties Sewing Machines in High Wycombe up popped a second hand 440 for sale. I literally dropped my mince pie, pushed past my bewildered extended family and jumped in the car! She's called Aurora - which my little space scientist girl just LOVES, although sadly she does everything but emit a multihued defracted lightshow above where I sew during midwinter. Miss Space Scientist was a little bit sad about that :( I however love everything about this machine. I'll write a proper review soon. Obviously a new sewing machine merits new sewing storage and a new set of pouches was in order to hold my bobbin box and feet. This kind of sparked a pouch avalanche as most of my family realised that they actually NEEDED a pouch for various Christmas present related issues and i just sewed variations on these pencil case and zippy mouthed pouches in every size for 3 days between Christmas and New Year! Such hardship. If your extended family could do with some pouch-based organisation ( who couldn't?) check out our Spring 2015 Class List for our new Pop Up Pouch Classes. 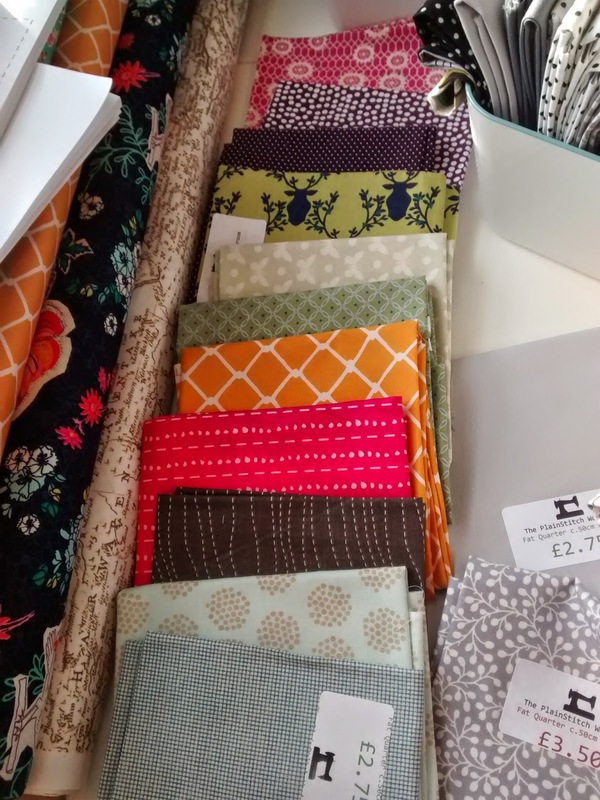 We've also just added more evening classes ( English Paper Piecing and Cathedral Windows), Pop Up Summer Bunting, Embroidered Needlebooks, Patchwork Sewing Machine Covers...... so much happening!